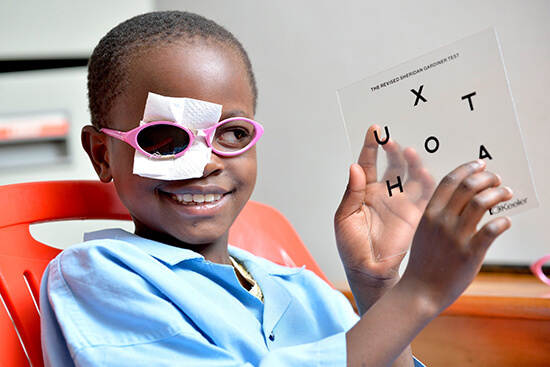 Change someone’s life through the miracle of sight. Share Jesus’ healing love with a child facing a lifetime of darkness today. 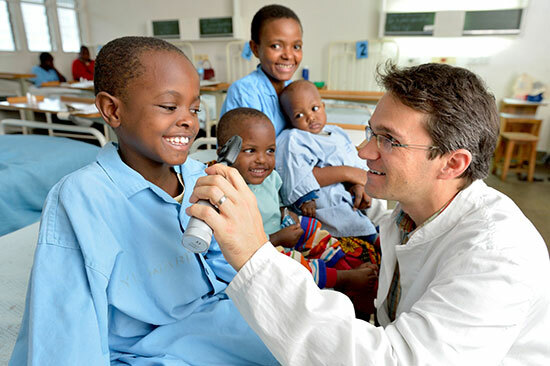 Children require anesthetic and an overnight hospital stay. Cataract surgery for adults is quick and easy. Patients go home the same day. Stella’s vision is clouded by cataracts. Her mother is worried that her daughter will get lost or hurt on the way to school. 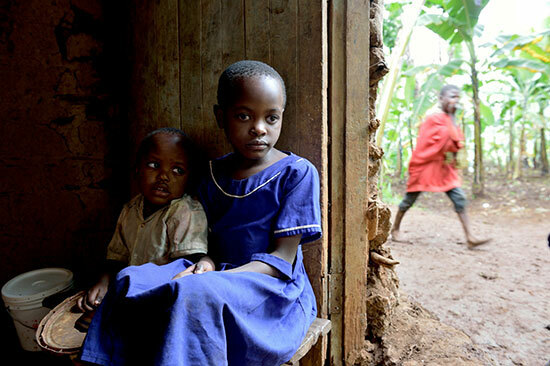 Without her sight, Stella’s future is in doubt. Stella was so brave during her surgery! After the bandages come off, the doctor tests her sight. Everything looks good! Stella is healed! She’s happy and excited to be going home soon. She can’t wait to show everyone how well she can see! 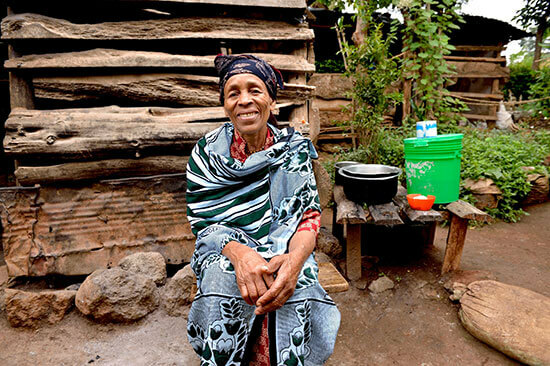 Theresia had lived in her village all her life. It’s where she’d raised 8 children, kept cattle and grew a garden. But now cataracts had blinded her. She had no choice but to move in with her son in another village. Theresia was so unhappy. She thought the rest of her life would be unbearable … just sitting at home, unable to work or even play with her grandchildren. 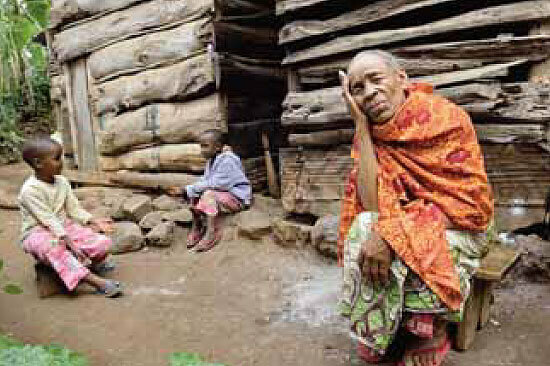 She had lost her livelihood and her independence. 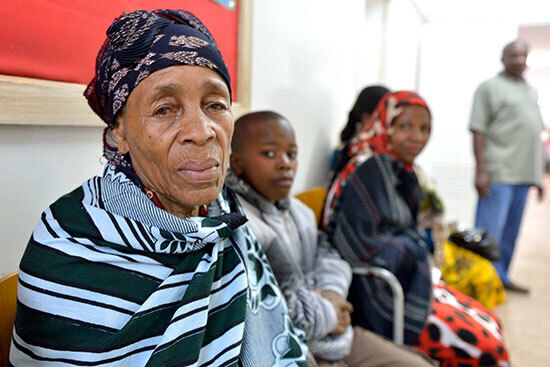 Thanks to the kindness of friends like you, Theresia was given free cataract surgery. It was simple and quick. When the bandages came off, Theresia could see again! Her world of darkness and despair flooded with light. Now that Theresia can see, she’s excited to get back to work! She can now care for her grandchildren, lead her cattle to grass, tend her garden and visit with friends. 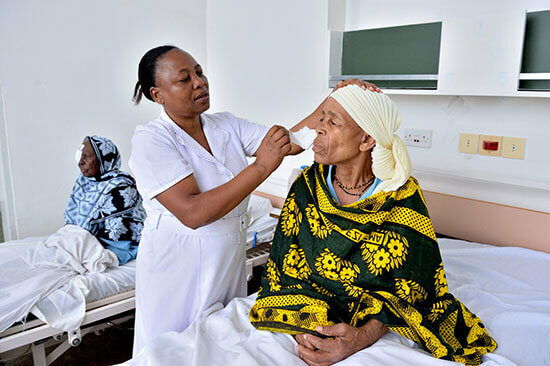 Theresia is so grateful for this miracle of new sight! Omari has had trouble with his eyes for years. He’d had some success in business and was able to provide for his family … but the cruel combination of glaucoma and cataracts changed all that. 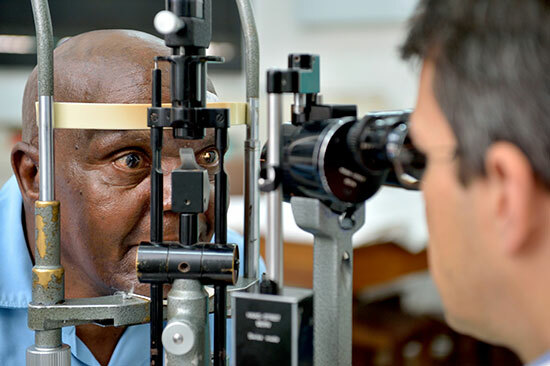 Without his sight, 57-year-old Omari had no choice but to stop working. It was a harsh turn of events for this former businessman! Then Omari’s life took a turn for the better—thanks to donors like you! 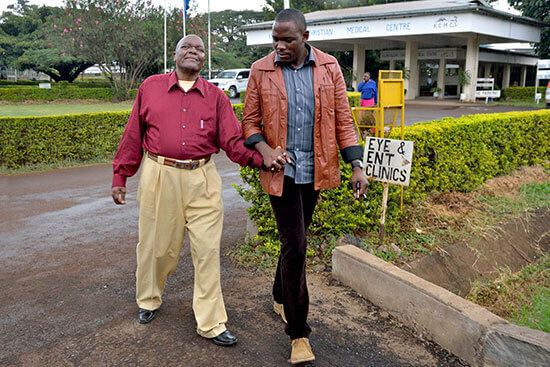 Omari went to the Hope and Healing International-supported eye clinic. 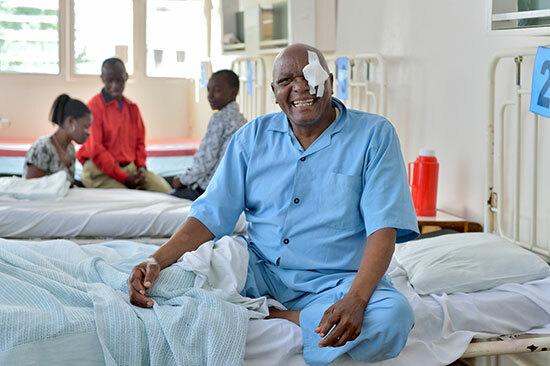 When the bandages came off after his operation, Omari couldn’t contain his joy. He could see! Now he dreams of getting back to work as soon as possible so he can fulfill his dream of buying a house for his family. Thank you for giving Omari and so many others the ability to follow their dreams! 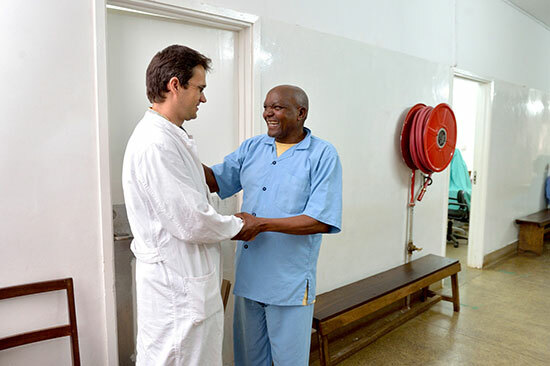 10-12 minutes is all it takes to perform sight-restoring surgery and change a life! 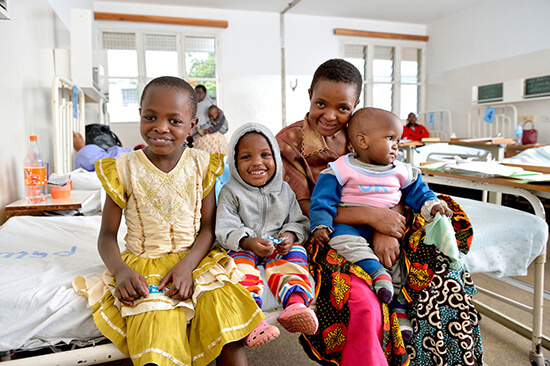 In the last 52 years, more than 12 million kids, moms and dads have received sight-restoring operations through Hope and Healing International. For adult patients, the doctors just use a local anesthesia so the surgeon can make a small cut in the cornea and remove the clouded lens. Then the surgeon replaces it with a new human-made lens. Most of the time sutures aren’t needed, which means patients experience lower infection rates and a faster recovery time—usually just 24 hours!